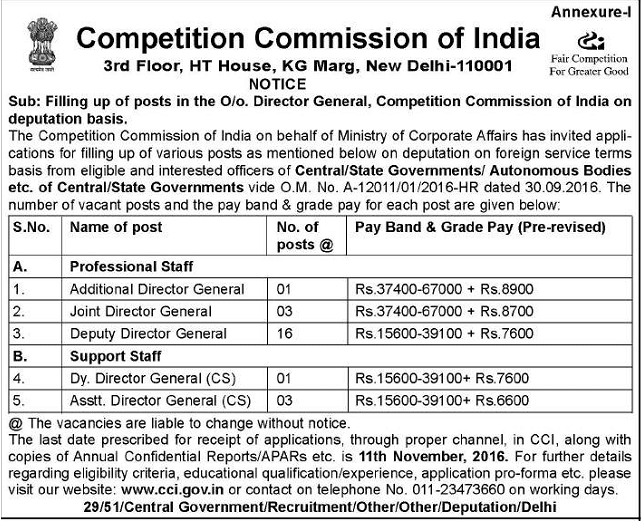 Competition Commission of India (CCI), New Delhi, is going to recruit individual for Professional Staff and Support Staff on Deputation Basis.The candidates may apply till 11th November 2016. Eligible and interested officers of Central/ State Governments/ Autonomous Bodies etc. The last date prescribed for receipt of applications, through proper channel, in CCI , along with copies of Annual Confidential Reports/APARs etc. is 11/11/2016. For queries contact on telephone No. 011-23473660 on working days.